Another day, another shocking revelation from inside the White House, which right now has more leaks than that wall in Holland saved by a little Dutch boy. But that fable pales in comparison to the official administration explanations following President Donald Trump’s private Oval Office meeting with Russia’s foreign ministry and its ambassador to the U.S. earlier this month. I just fired the head of the F.B.I. He was crazy, a real nut job. I faced great pressure because of Russia. That’s taken off. Even that is no longer true. 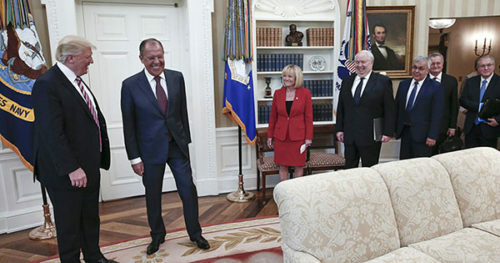 U.S. President Donald Trump meets with Russian Foreign Minister Sergey Lavrov, second left, at the White House in Washington, Wednesday, May 10, 2017. 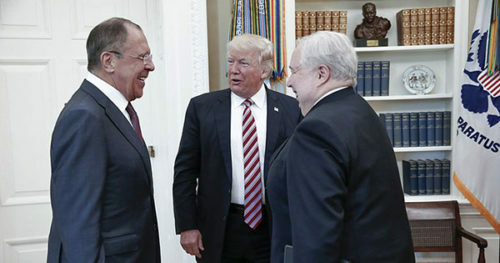 Fourth from right is Russian Ambassador to the U.S. Sergei Kislyak. Former FBI director Robert Mueller is now investigating the matter as a special counsel appointed by the Justice Department, not only for potential collusion, but also possible obstruction of justice. And as a result, Twitter is aflame with memes, GIFs and just overall “WTF” tweets. "I just fired the head of the FBI. He was crazy, a real nut job. I faced great pressure. That's taken off." This feels like a game of Clue. Is it Trump leaking, from the Oval Office? Mike Pence, from the Observatory? Bannon, from wherever? As the paper reported, the statements the president did make to the Russians about Comey serve to bolster the narrative that Trump fired him mainly because of the bureau’s investigation of potential collusion between his presidential campaign and Russian operatives. Even though Trump himself suggested ending the probe was his motivation, the White House has changed its justifications for the firing several times. This time, White House press secretary Sean Spicer didn’t dispute The Times report. By grandstanding and politicizing the investigation into Russia’s actions, James Comey created unnecessary pressure on our ability to engage and negotiate with Russia. The investigation would have always continued, and obviously, the termination of Comey would not have ended it. Once again, the real story is that our national security has been undermined by the leaking of private and highly classified conversations.